During the Paris Retromobile Classic Car Show, the Polo Storico of the Lamborghini factory and Autodrome Paris, will display the one-off Pregunta V12 (Geneva 1998) at the Lamborghini-Paris showroom. 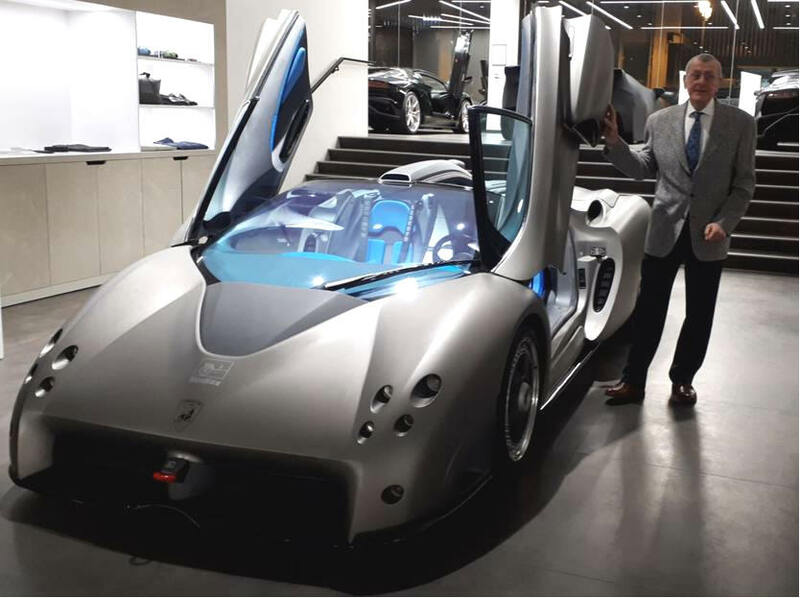 The presentation will take place on February 8th, only upon invitation to Factory Clients and Lamborghini specialists, with a speech from Mr. Stevanin, Polo Storico Lamborghini Director, and from M. Piero Stroppa, designer and former assistant to Mr Gandini and Giugiaro. Among all Italian prototypes and dream-cars of the XXth Century, very few have such a visual impact and radical concept. 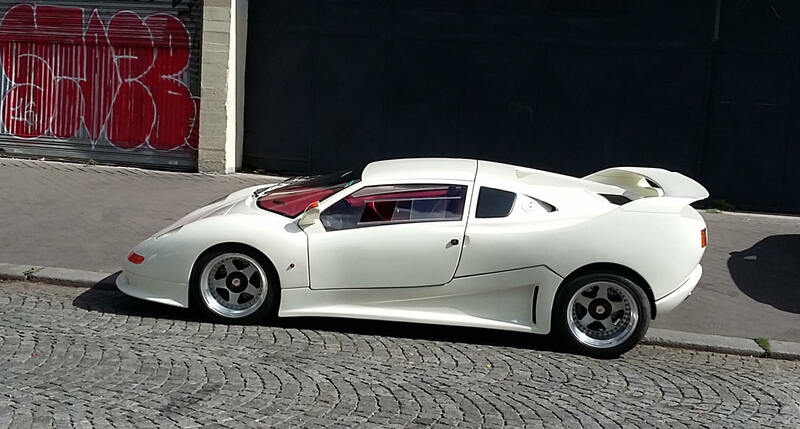 The Pregunta is built on a modified Diablo chassis and engine, and could have made it to production, as the Lamborghini extreme Super-Car of the years 2000. Learn more here. Autodrome recently entrusted the Lamborghini Pregunta to the Polo Storico for certification. This triggered the decision for Lamborghini to display this prototype - that we presented ourselves only one time, at the Rétromobile 2007 Show. This unique opportunity will enable Collectors and experts to examine this (perfectly operational) Lamborghini dream-car, as a swan song of the "Italian" period of the Sant’Agata make, and a statement of bold audacity and style. 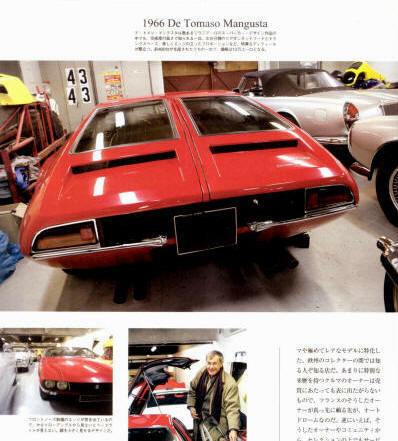 In addition, after Retromobile, Autodrome will loan the Pregunta for a few months to be exhibited at the Sant'Agata Factory museum, among the most legendary Lamborghini in history. 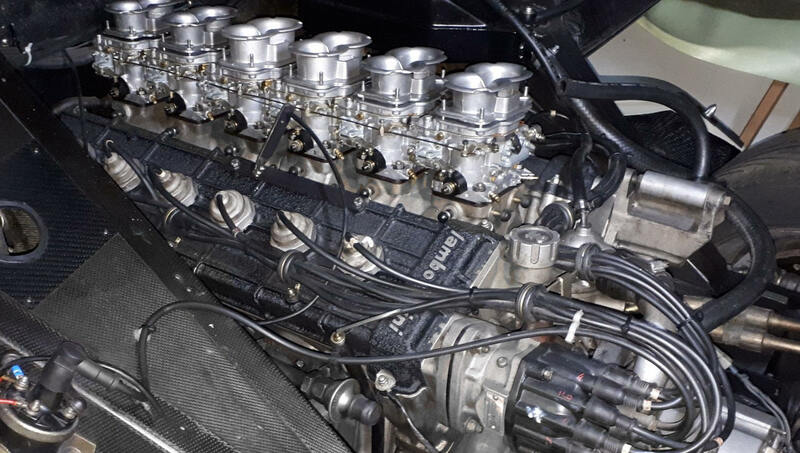 This fabulous V12 quad-cam engine was a dream combination with the carbon chassis, a world-première for a road-car. 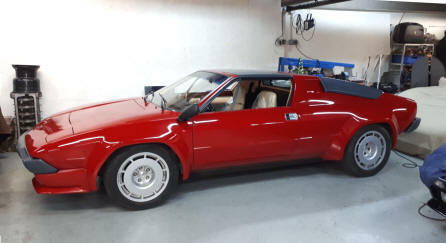 Lamborghini Countach LP400S Series 1 "Low-body"
"Certainly the nearest thing to a Cosworth I have ever driven on the road"
This fine no-rust example was delivered new in Italy, and has been in the hands of a former Lamborghini Importer for 25 years. Odometer shows a mileage of 35,000 km only. Very good condition, upholstery exceptionnally preserved, supple and voluptuous. 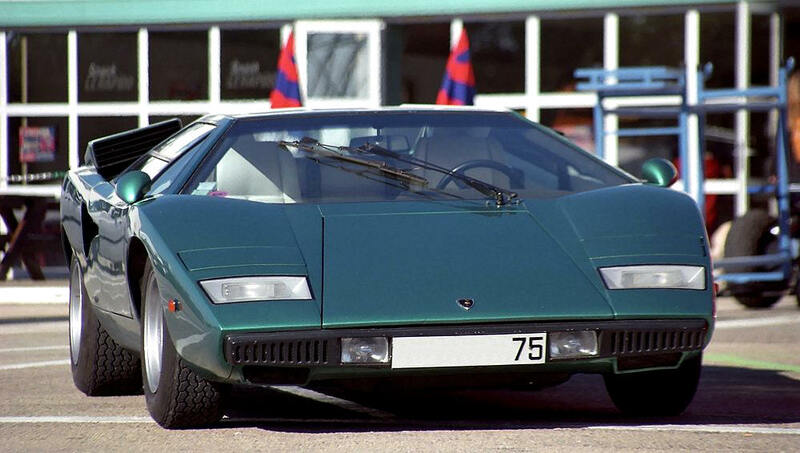 A rare and thrilling Classic Lamborghini. Price: 115,000 €. Very early example, inside fuel filler, single mirror, only 2800 km on the odometer. No rust, engine starts and runs wonderfully. She needs some cosmetic work: upholstery has to be re-assembled, it was partly dismantled in view of a new paintwork (needed). More detailed information on request. Price : 75,000 €. First Lamborghini in History, powered by the legendary V12 designed by Giotto Bizzarrini, who designed the Ferrari 250 GTO. With the 350 GT, Ferruccio humbled Enzo Ferrari, with 4 OHC, independent suspensions on all wheels and a fabulous Touring Sperleggera bodywork. Ours is the 6th Lamborghin ever built. The very source of the Legend. 730,000 €. Powered by the (mildly modified) Daytona engine, styled by Leonardo Fioravanti (designer of the Daytona et of the BB), it was the most expensive Ferrari of the time, acquired by par Mick Jagger and other celebrities. Our example is in remarkable condition, with original leather. Very attractive investment. 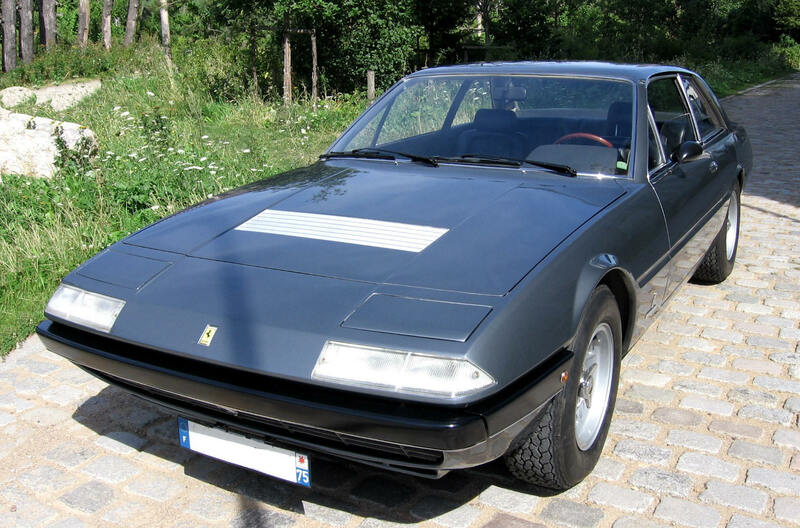 The best investment opportunity in a Classic V12 Ferrari. FOURNIER-MARCADIER Barzoï 1600 S Gordini (1966) "Gullwing"
The one and only Lamborghini motorcycle was so expensive that only a handful were ever built. 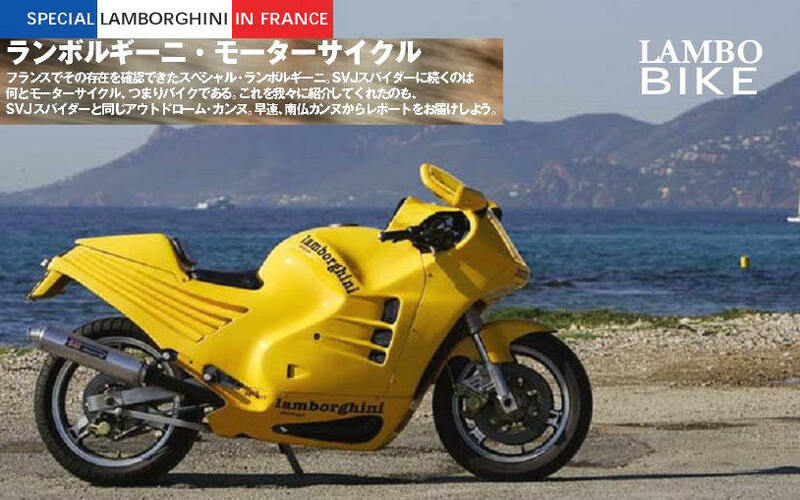 Designed for Lamborghini by the racing motorbikes manufacturer compétition Boxer-Bikes, it offers the best technology with an outrageous, Countach-inspired fairing style. Autodrome owns two, a 900cc example and another, with 1000 cc engine. 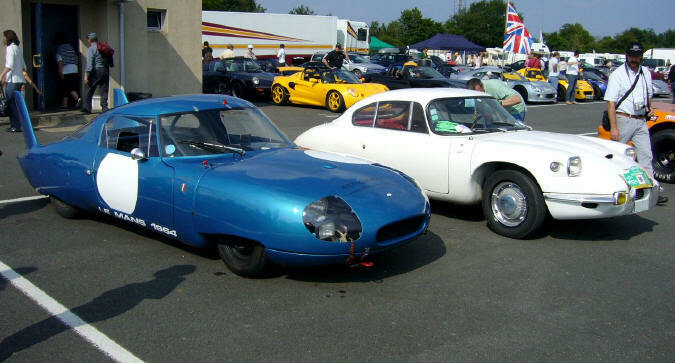 The very first René-Bonnet "Djet" was a prototype raced at Le Mans in 1962, followed four months later by the street version, which was the first road-legal mide-engine car in History. 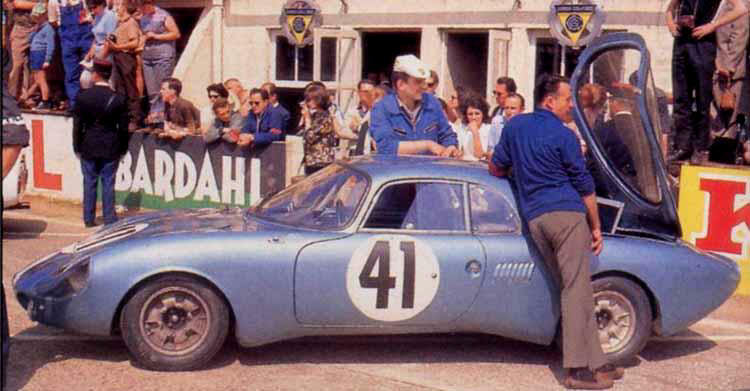 The following year, for the 24 H. of Le Mans 1963, a new, extended bodywork was developped, called "Aerodjet". Three Aerodjet partcipated in the race. Chassis #7014 took the 11th position overall, and won the Indice Energetique ...before the winning Ferrari. 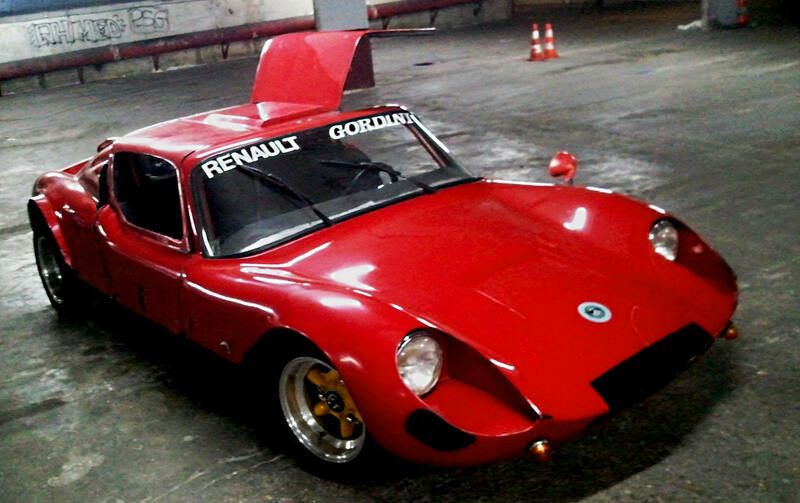 Aerodjet #7013 auctionned by Artcurial was powered by the Gordini 1108 cc engined created by Amedeo Gordini for racing. Due to technical problems the car finished the race but was not included in the overall ranking. The later Djet VS and Djet VI, with Gordini 1108 cc and 1300 engines are the direct descendants of the Le Mans Djets. 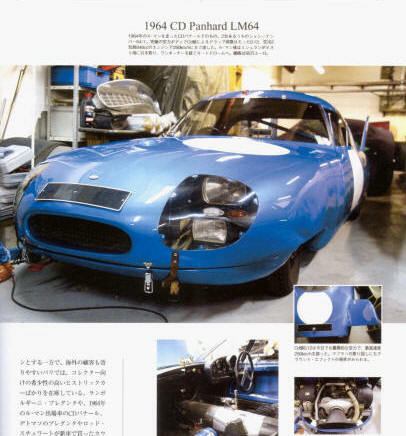 Very close to the Mans protytpes: 612 Kg for the race cars and 615 kg for a Djet VS. Tubular chassis was modified to incorporate a central beam but the ultra-light glassfibre bodywork stayed a structural part of the car. 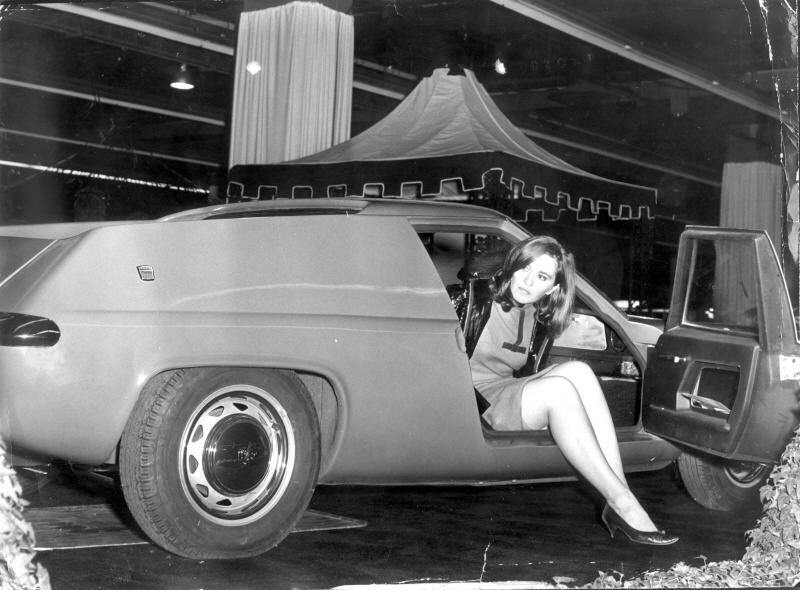 This aerodyamic berlinette is simply the first mid-engine road-car in History...! 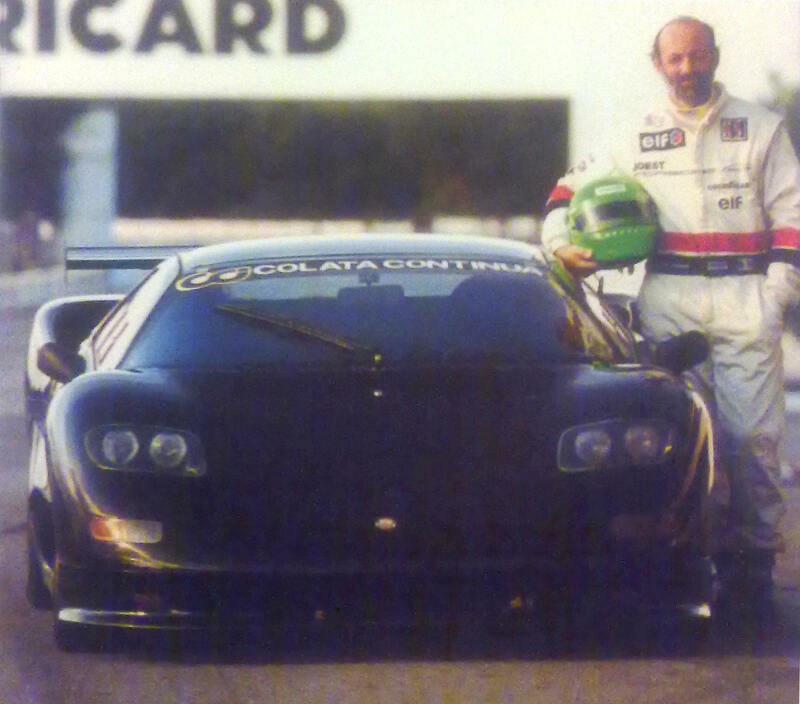 Multiple Le Mans winner Henri Pescarolo tested the Monte-Carlo Lamborghini on the Castellet-Paul Ricard race track. Fulvio-Maria Ballabio persuaded Lamborghini to officially supply their latest V12 engine - taken from the Countach Quattrovalvole ! A huge 455 HP power was now available to make the future mid-engine super-car a true "prototype for the road" that would challenge the cream of the cream of Luxury GTs. 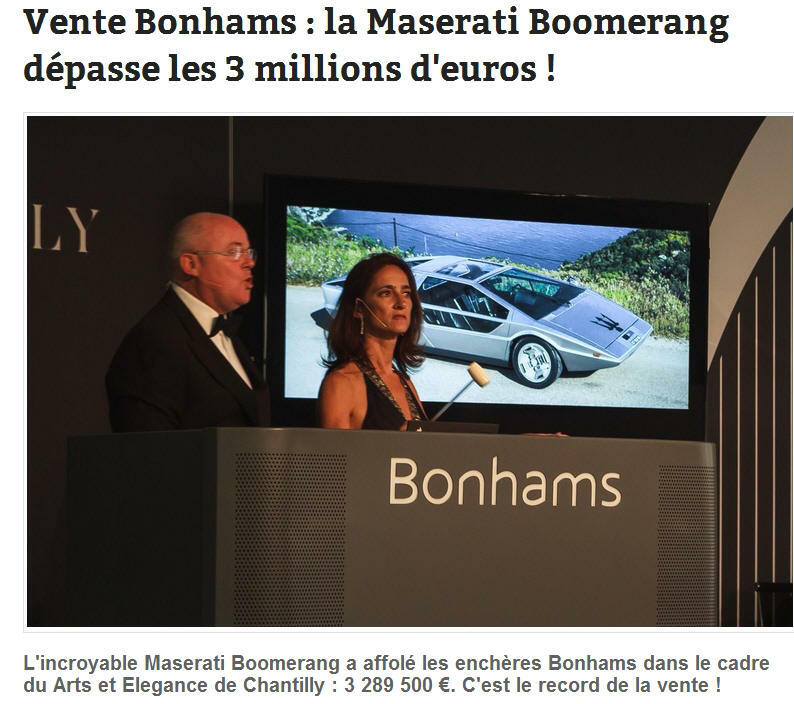 Chiti and Bellasi managed to present the first carbon-chassis GT in History in 1990, beating the "neo-Bugatti" EB110 by almost a year...The Monte-Carlo berlinette was named "Centenaire", in celebration of the centennial of the Monaco Automobile Club. Whilst the Ferrari F40 offered a couple more HP (475), in return the Monte Carlo boasted a carbon fibre hull which humbled the old-school tubular chassis of the F40. 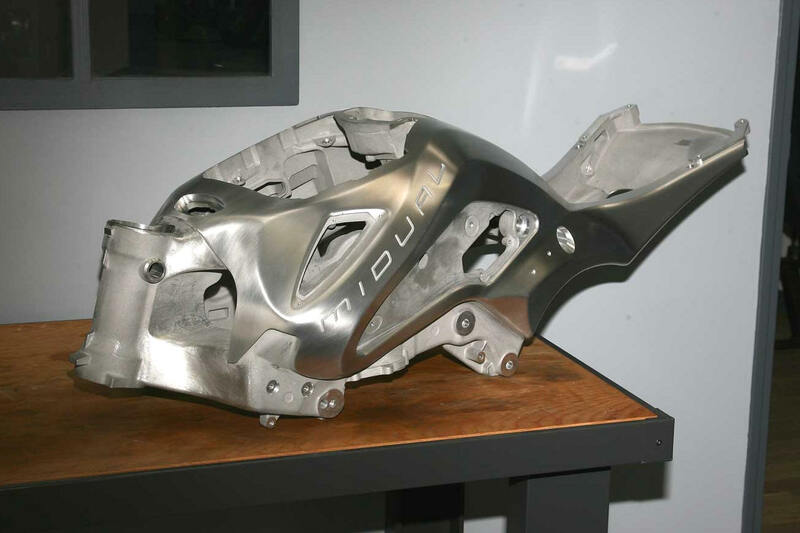 A memorable achievement for an extremely small and young car manufacturer. A most impressive race-inspired berlinette with Lamborghini V12 power and carbon fibre chassis - what did you expect ? 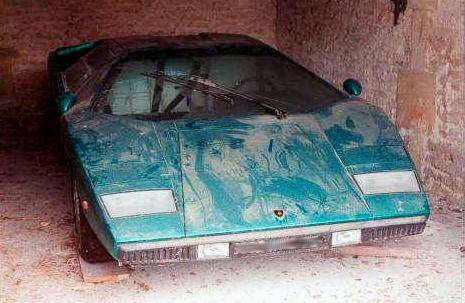 Very limited hand-crafted production started soon, followed by another version called GTB, also in extremely small numbers (maybe two or three)...The very first Monte-Carlo was first acquired by the Lamborghini factory, then returned in the hands of founder Ballabio, and is now property of Autodrome-Paris. 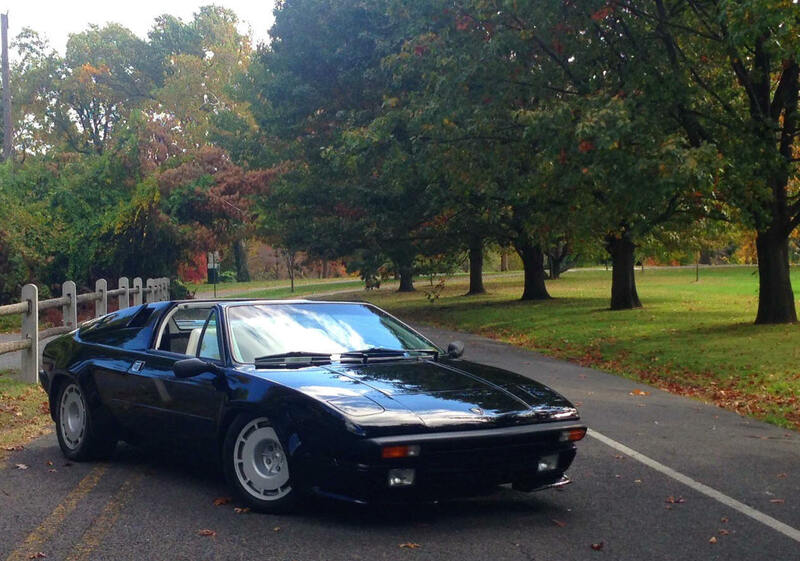 We are very proud to own this important piece of Lamborghini and Supercar History. The driving sensations of this no-compromise super fast GT are matchless, and the history behind this supercar is absolutely unique, with its Lamborghini partnership, Monaco Royal support and its bold, high-performance, high-tech concept. 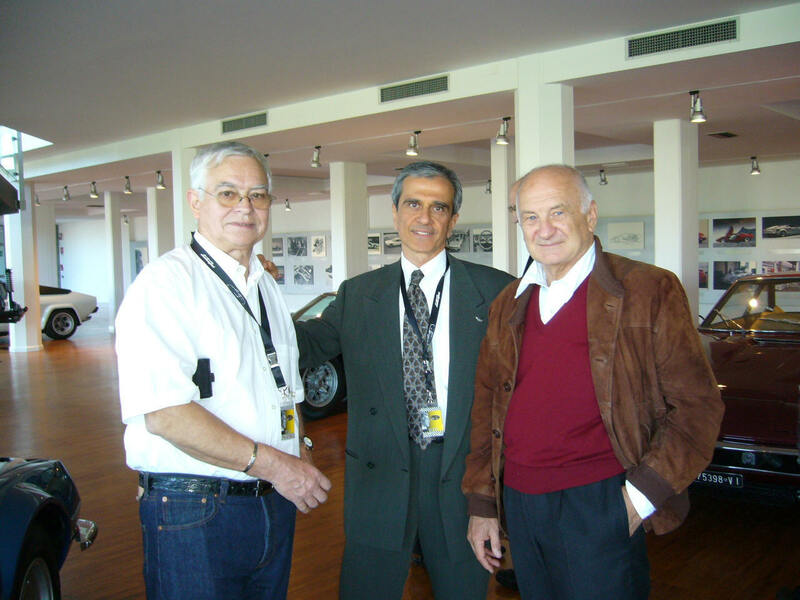 Engineer Paolo Stanzani (right), with Edmond Ciclet (Lamborghini-France, left) and Michel Levy (Autodrome, centre) at Lamborghini Sant'Agata factory. 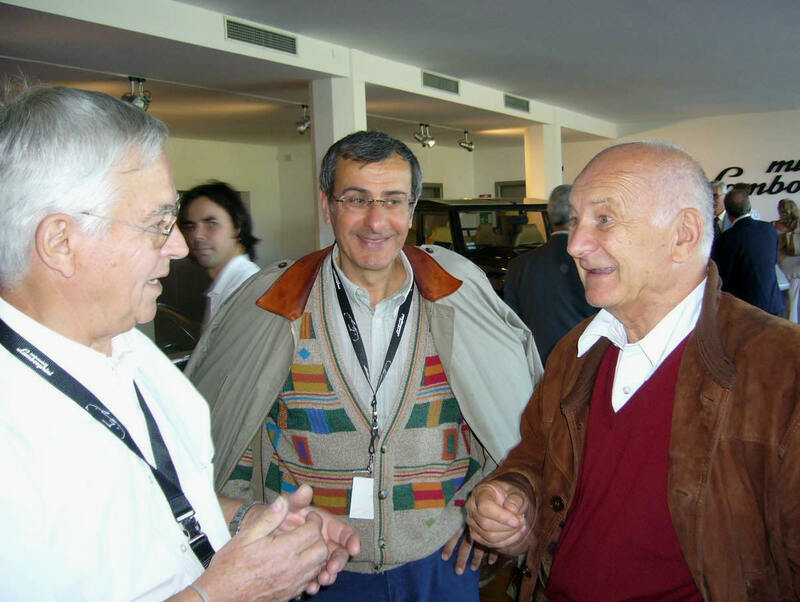 We have learned the sad news of the death of Paolo Stanzani, who created the very first Lamborghini in 1963, just after being hired by Ferruccio, with Gianpaolo Dallara. 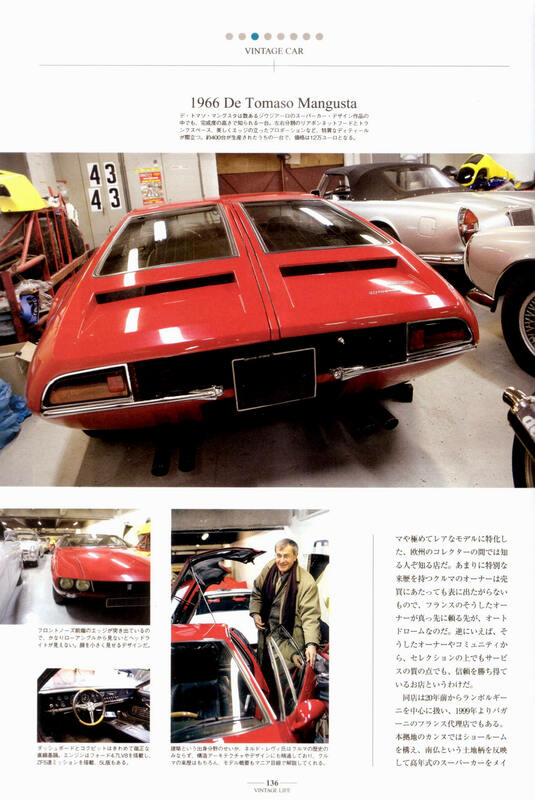 The Miura, the Espada, the Countach, the Islero, the prototype Bravo, all those legendary automobiles bear the fingerprint of Stanzani. 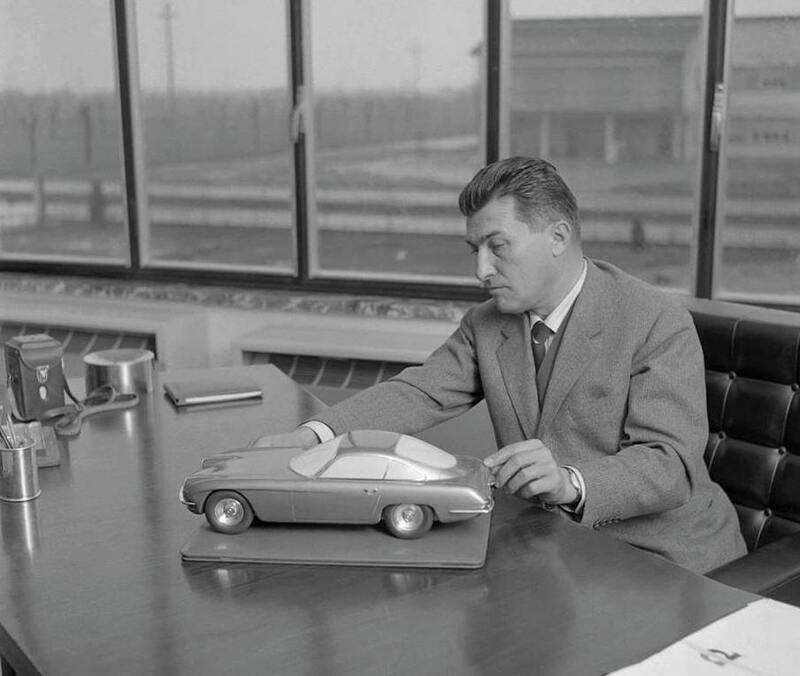 Very young (24 years) in 1962 when he became part of Ferruccio Team of talents, he nevertheless managed, with a handful of highly gifted young designers and engineers, to create the car that would beat Ferrari: the 350 GT, first Lamborghini in History and a car that re-invented the meaning of Gran Turismo. 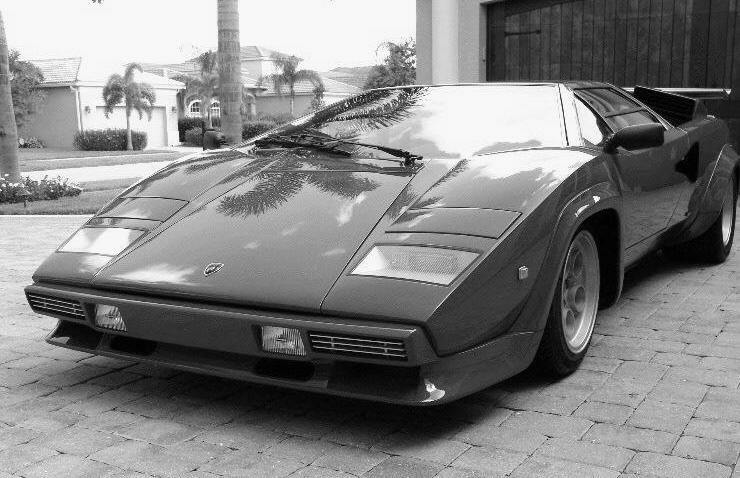 The Countach was Stanzani's next achievement, a car that broke all rules with an out-of-this world Gandini design. The V8 Jalpa 3,5-litre engine is another of his technology brainchild. 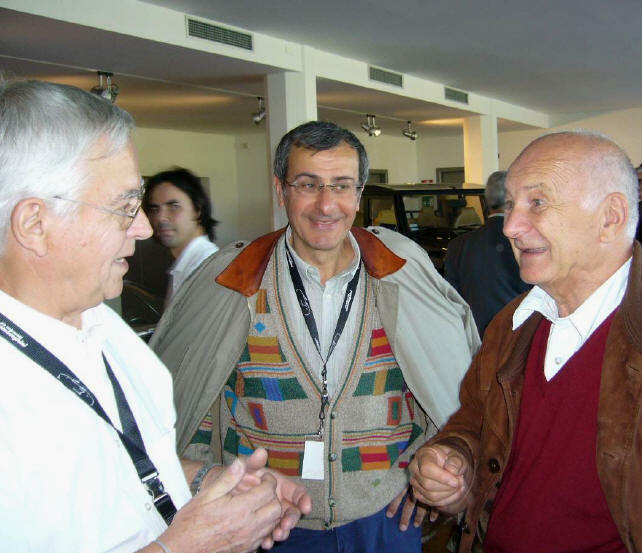 Stanzani was also in charge of the conception of the Bugatti EB110, but left the Company due to disagreement on strategy with the the boss Romano Artioli. Even though his talent is the root from which the EB110 originated, his name has been "politically" and unfairly cancelled from the history of the firm. Together with the 350 GT, the Miura and the Countach LP400, the EB110 remains one of his materpieces and one of the most advanced automobile of the past Century. 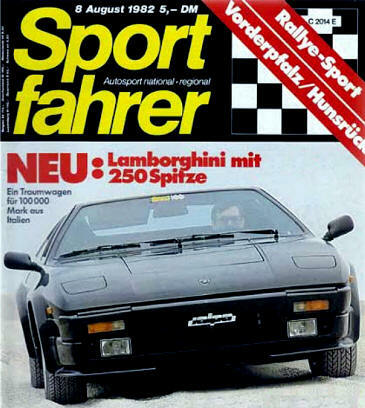 Paolo Stanzani gave us two interviews about the birth of Lamborghini and of the Countach, and about the "resurrection" of Bugatti in the early nineties. After the 350 GT, "better than the contemporary Ferrari", Lamborghini launched the Miura, of which around 650 examples would be built. 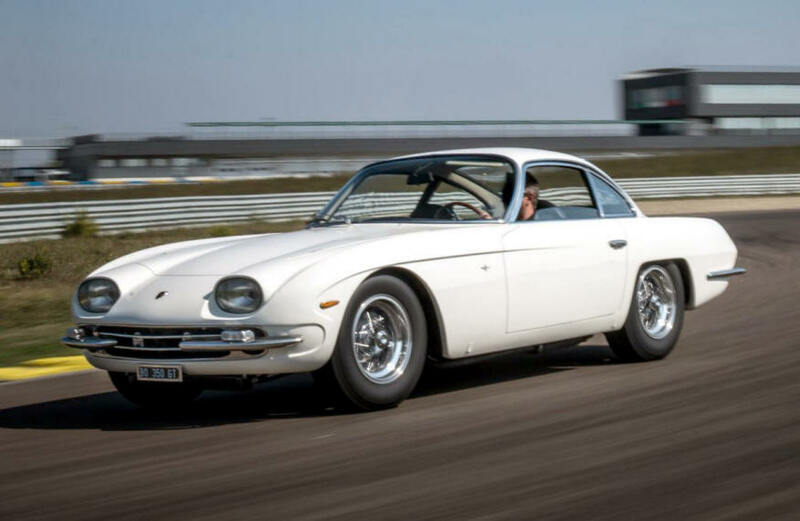 The first and rarest Classic Lamborghini V12 remains the 350 GT. 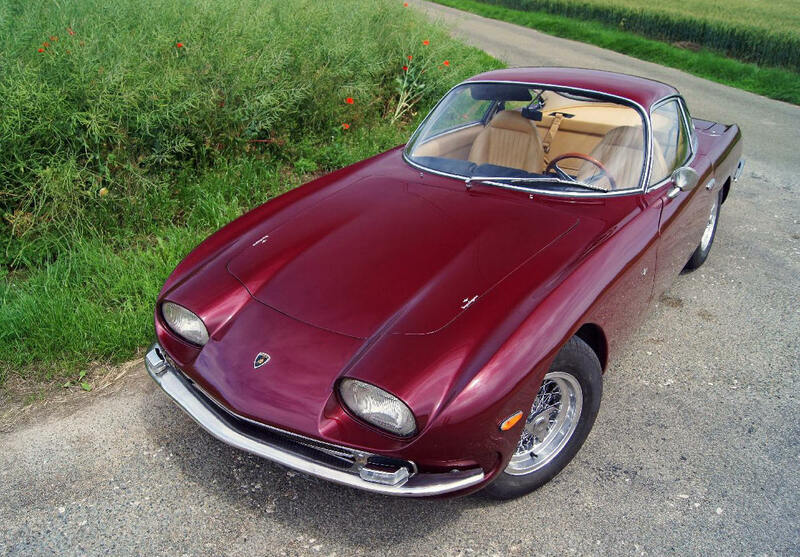 We own the sixth Lamborghini 350 GT ever built - the earliest available ; now for sale. 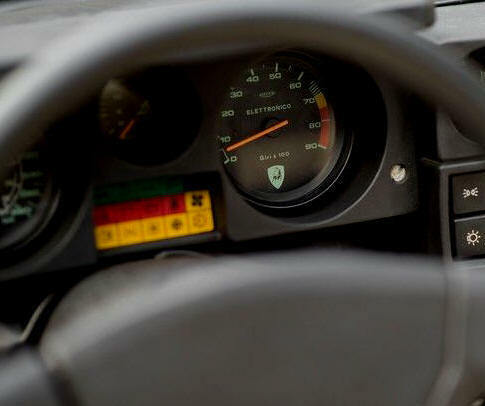 Lamborghini is the only Car manufacturer in History that has gained an immediate, world-wide fame with its first model. It could have come from the outer space : the 350 GT, presented by a then unknown Company was technically superior to the contemporary Ferraris - the pinnacle of Sports Cars at that time. 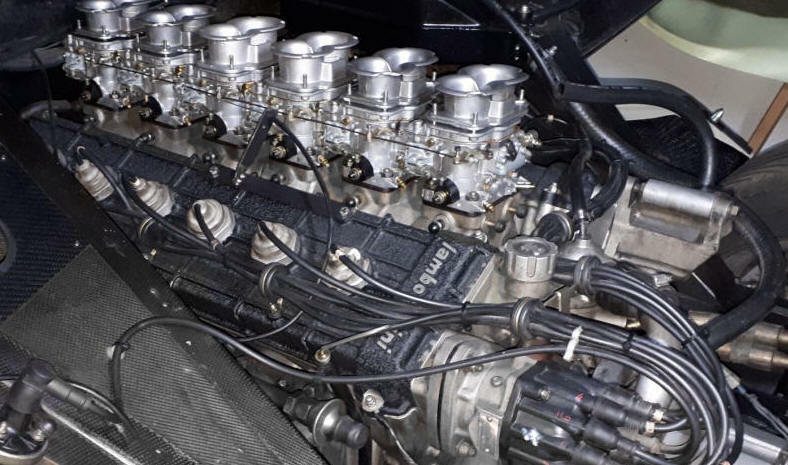 With its magnificent 4 OHC V12 all-alloy engine, front and rear independant suspension, Dallara-engineered chassis, an incredible quality of details, and a revolutionnary style that went beyond the mainstream of the early sixties. The shape combines elegance and energy, with not even a fraction of inch in excess ; the distinctive oval headlights stand proudly over the front boot in a sculptural manner ; the roof and pillars are of an exquisite delicacy, in contrast with the long and masculine front end ; the hyper-elegant and minimalist rear fenders suggest serene and immense power without any useless gimmick. 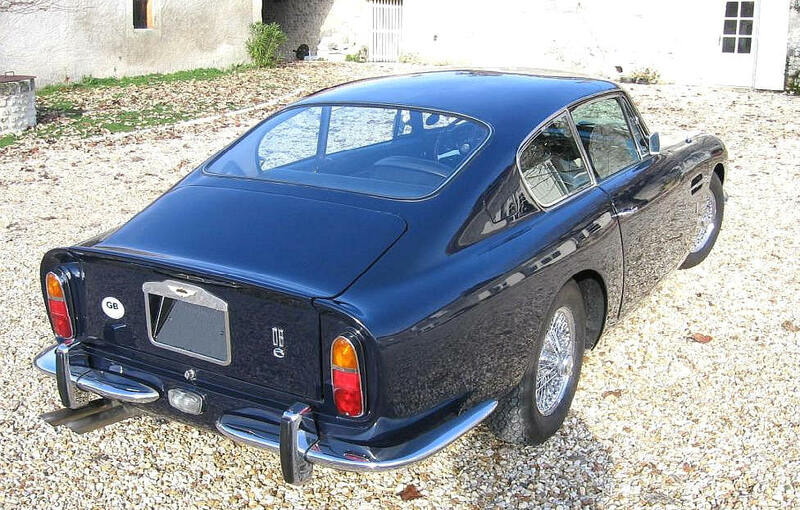 As a matter of fact the bodywork of the 350 GT is absolutely unique and has no common part with the 400 GT, that came just after : general volume is lower, rear window is larger, front fenders are more fluid ; the style is of a genius - Carlo Bianchi Anderloni of Touring - , a graceful and perfect inspiration. This rare automobile is comparable to a Michel-Angelo or Raphaël sketch. Nothing is overplayed, yet everything is there. The 350GT is a pure two-seater, lighter and leaner than the 400 GT 2+2. 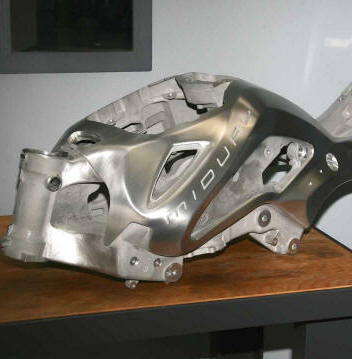 This light weight is the result of the use aluminum for all bodywork elements - (steel on the 400), fitted on a highly elaborated Superleggera thin tubular structure. The 3,5 Litre of the 350 GT became a 4,0-Litre for the 400, and the gearbox is a ZF, whilst Lamborghini used their own, more economical gearbox for the 400GT. The number of 350 GT built is not established : in these early days (and even later) Lamborghini didn't pay much attention to written records. Official production figure is 120, but there are reasons to believe that only a hundred were actually delivered. 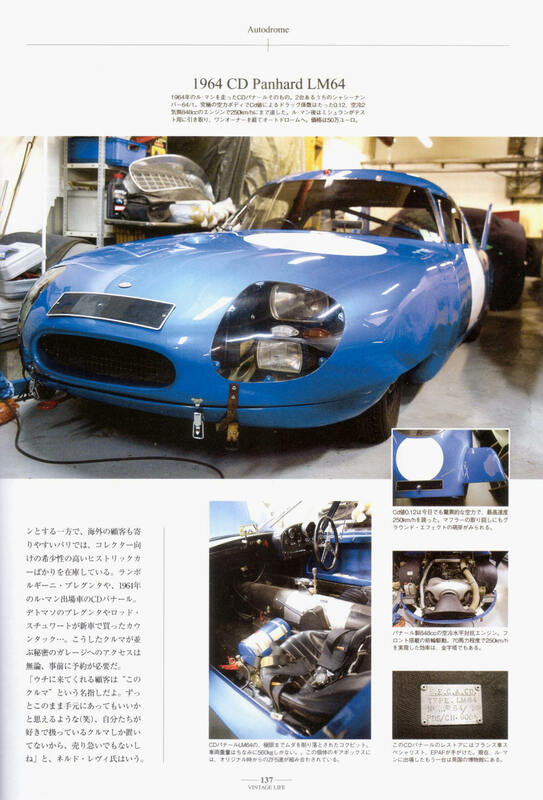 The wherebouts of at least thirty 350 GT is unknown. On today's market, the offer of 350 GTS is very limited. The privileged Collectors who own a 350 GT keep them safely in their garage, as an inestimable Automotive Art Master Work. A sublime modern sculture : with minimalist finesse Bianchi-Anderloni (Touring) combined power and elegance to achieve a unique Masterwork. 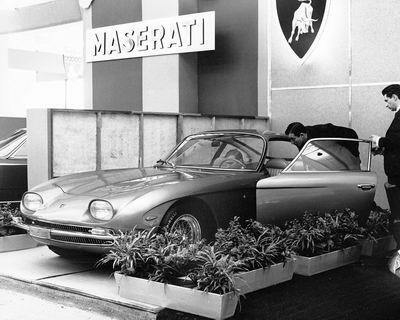 Our car for sale is very probably the one that was displayed on the Lamborghini Stand at the Salon de l'Auto de Paris 1964 (picture below). 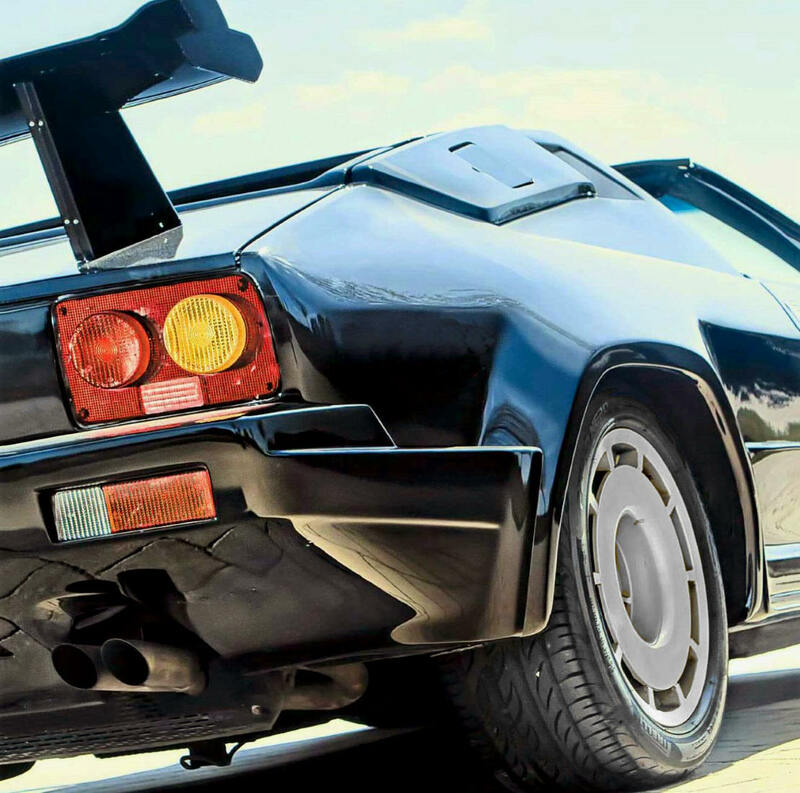 For decades, AUTODROME has been collecting, restoring and selling the most beautiful and rare Classic Lamborghini. of advanced style designs for Collectors : in the seventies, the Boomerang set a new style trend with its design based on straight lines. 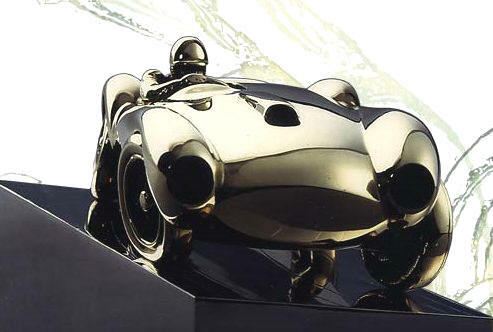 "Ferrari 375 MM", Sculptor: Alain Moitrier, cast bronze, 1989. One of only 4 Artist's pieces. 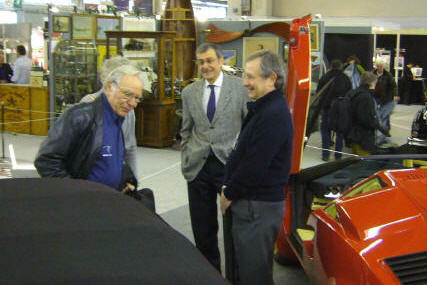 RETROMOBILE 2010 : AUTODROME WAS PRESENT..
Left : Mr Jules Heumann, founder of the Pebble-Beach Concours of Elegance visits Autodrome's stand (with necktie: Neldo Levy, Director of Autodrome). 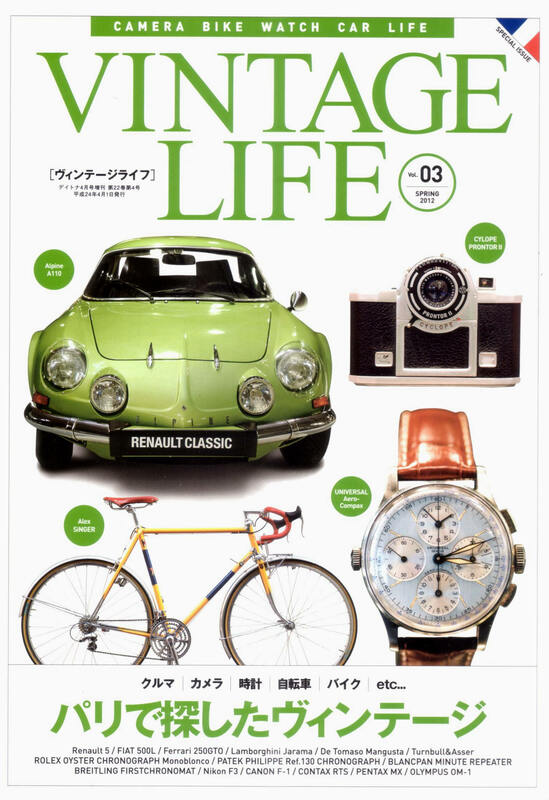 Right : before the official opening, three great Gran Turismo of the 50s, 60s and 70s : Aston Martin DBS, Lamborghini Countach LP400, Lancia Flaminia Touring. A major step in Sports cars History: how Chapman brought the F1 feeling to the road. 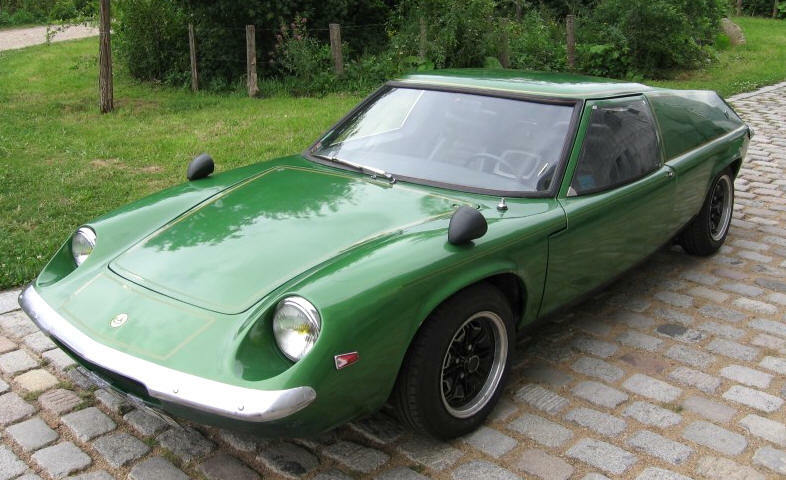 The Lotus Europe - type 46 -, revealed in 1966 is one of the very first GT with central engine, very close to racing prototypes. Only a few have survived. Driving sensations are second to none. The competition type 47 version was a huge success on track. Sought after by most Collectors, this kind of ultra-light hand built Classic GTs are impossible to build today, because of the legislation. 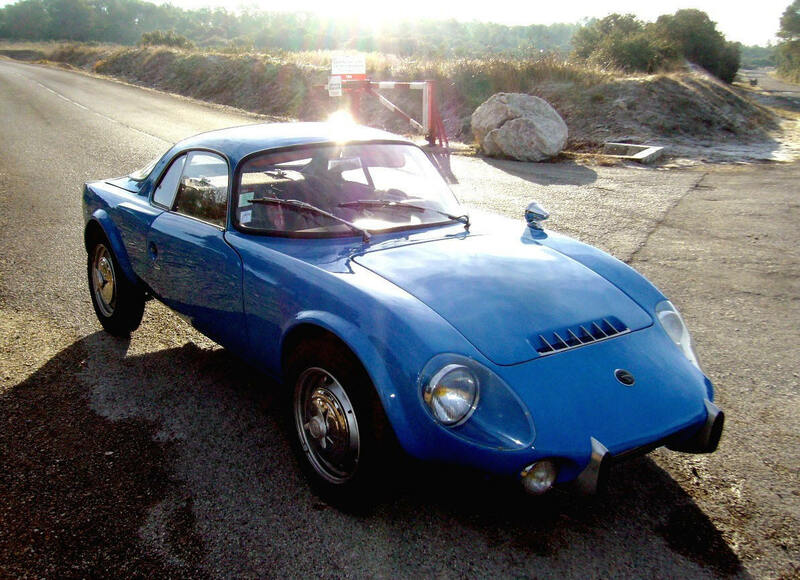 Interest for these sports cars is rising: Alpine, Matra-Bonnet Djet, Porsche 911 short wheel base (1966-67) are steadily on the rise in the market. A few of the fine automobiles parked during the Lamborghini meeting. AUTODROME was invited to a really unique event : a friendly gathering of all the people who made the Lamborghini legend. 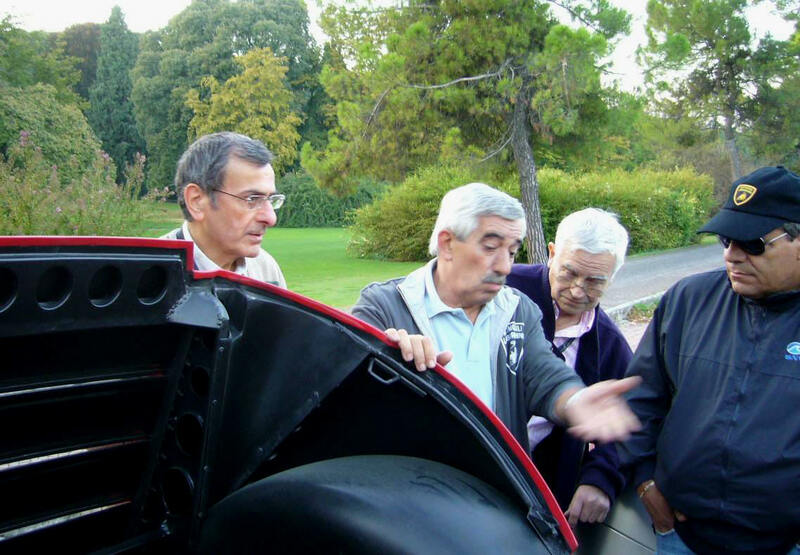 Paolo Stanzani, Giotto Bizzarini, Ubaldo Sgarzi, Claudio Zampolli, GianCarlo Guerra, Orazio Salvioli, Fabio Lamborghini, Umberto Marchesi (chassis manufacturer) are only a few names among Ferruccio Lamborghini's Team that came to Sant'Agata for this exceptional days. 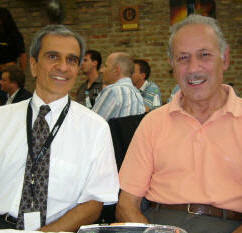 From L to R . 1- Neldo Levy (Autodrome) and Cesare Lodi, former Lamborghini test driver . 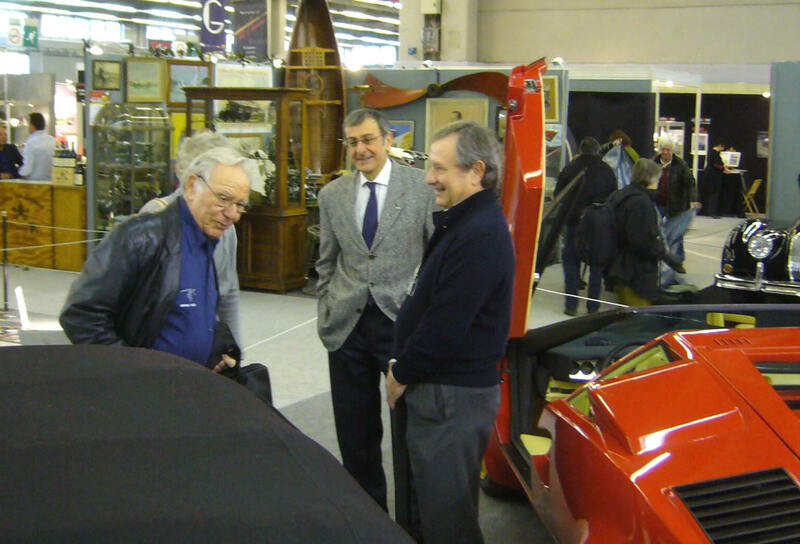 2- Edmond Ciclet, former Lamborghini France Technical Director talks to N. Levy and Paolo Stanzani, who designed the Miura with Dallara, and the Countach, and Lamborghini CEO in the 70s. 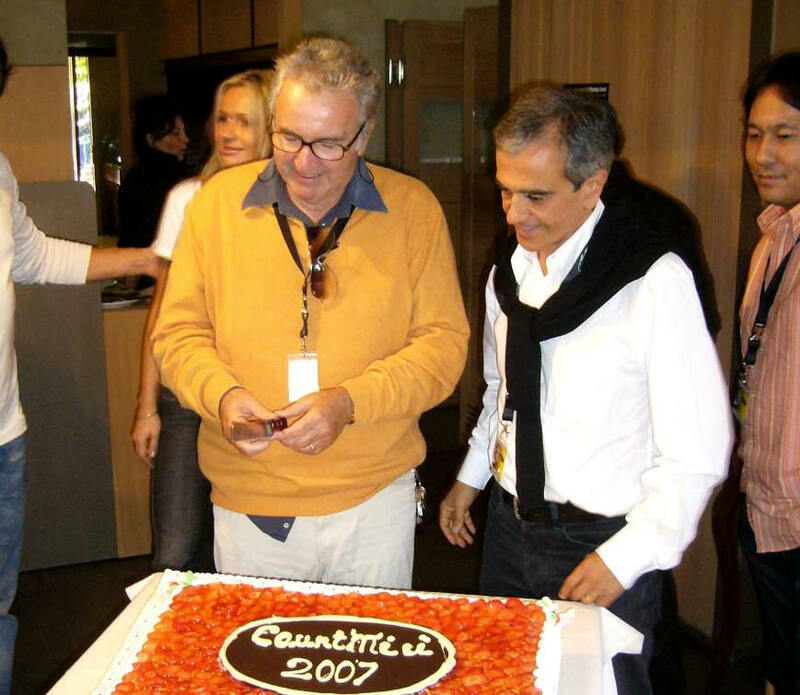 3- Michel Levy (Autodrome) with Giancarlo Guerra, former Scaglietti Head, who then was in charge of the Countach bodywork shop at Lamborghini. 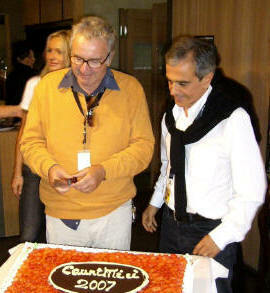 4- M. Levy with Ubaldo Sgarzi, former Lamborghini and Pagani Commercial Director. 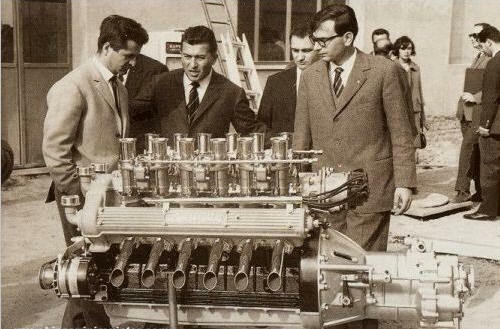 5- M. Levy with engineer Giotto Bizzarini who designed the first V12 Lamborghini after designing the Ferrari GTO. 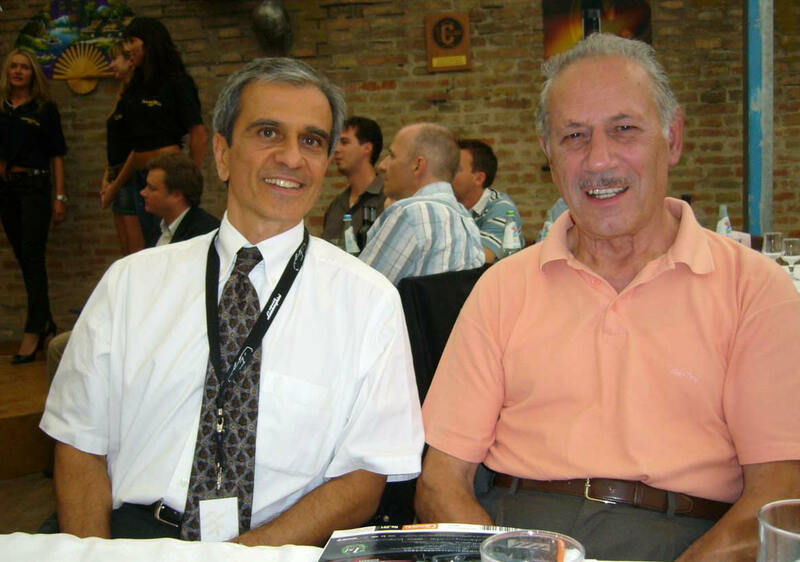 6 - M. Levy with Paolo Stanzani, "God" for many Lamborghini lovers. This gathering was focusing on people rather than cars, and very different from other events. It is very important to listen to all these key players of a period now gone, so as to record and preserve all the available information on the History of Lamborghini. This avoids all risks of distortion or mishandling of essential historical information. As Lamborghini collectors and historians, we have always strived to stay in direct contact with the former Lamborghini people, and we will continue to update and complete available information on this magical period. 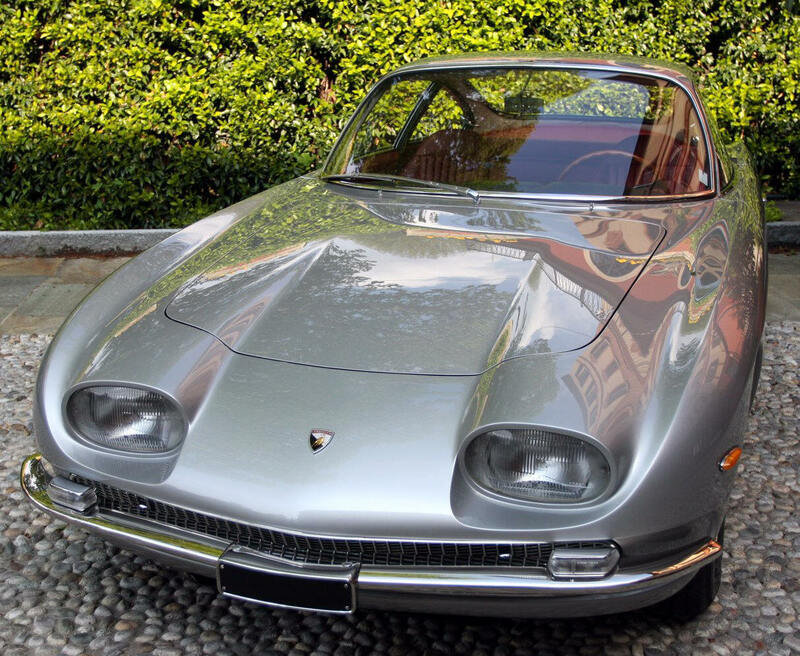 The Lamborghini 350 GT of Edmond Ciclet (former Technical Director of the Lamborghini network in France). 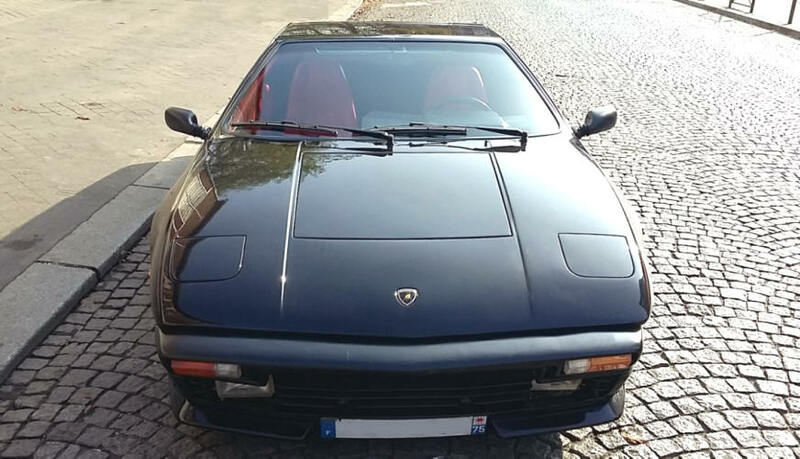 This car is one of the earliest Lamborghini in existence, and it is of course in perfect condition : 1200 km, and back were just a warm-up. As anticipated, this magnificent classic won the most sought-after prize of the best Lamborghini at the meting.. 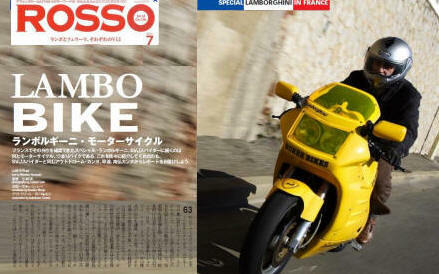 The famous luxury Japanese magazine ROSSO, specialising in classic cars, especially Lamborghini and Ferrari, was visiting Autodrome-Cannes a few months ago and has issued a long article on some of the "pearls" of the Lamborghini Autodrome collection (please click on the photos to open the 2 MB pdf document). 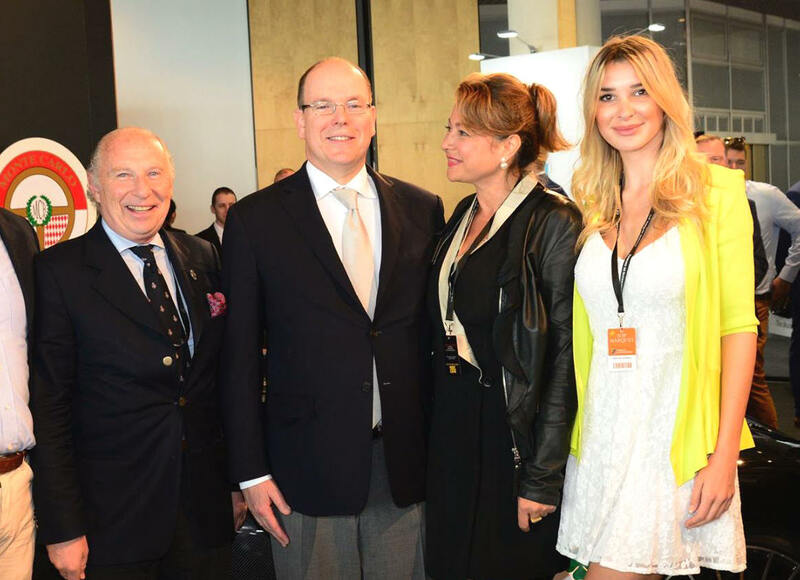 The famous charity event "SPORT & COLLECTION, 300 FERRARI AGAINST CANCER" took place last week-end (1-2-3 june) on the Val-de-Vienne Circuit near Poitiers. AUTODROME was presenting the CD-PANHARD LM64, one of the only two extraordinary prototypes having taken part in the 24 hours of Le Mans 1964, along with the Ford GT40, the Ferrari 275 P and GTO... A perfect opportunity to meet our clients and friends, and share our passion for classic and sports automobiles around this wonderful and famous racing car. 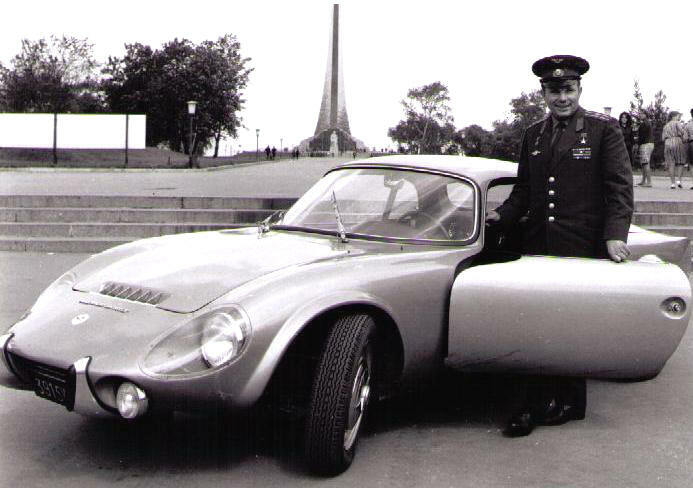 Our CD-Panhard on the track : taken over by a Ferrari prototype, driven by David Piper in person ! What more could you dream of ? A resurrection of a scene from the 24 Heures of Le Mans, with Ferrari (275, 330 P, LM), Ford GT, Cobra, and CD LM 64 as key players. Another memorable scene, seen from the cockpit of the CD-Panhard LM64: we give way to a fabulous Ford GT40. In the 1964 Le Mans race, the last surviving Ford driven by Phil Hill & Bruce Mc Laren retired roughly at the same time as our CD #45. 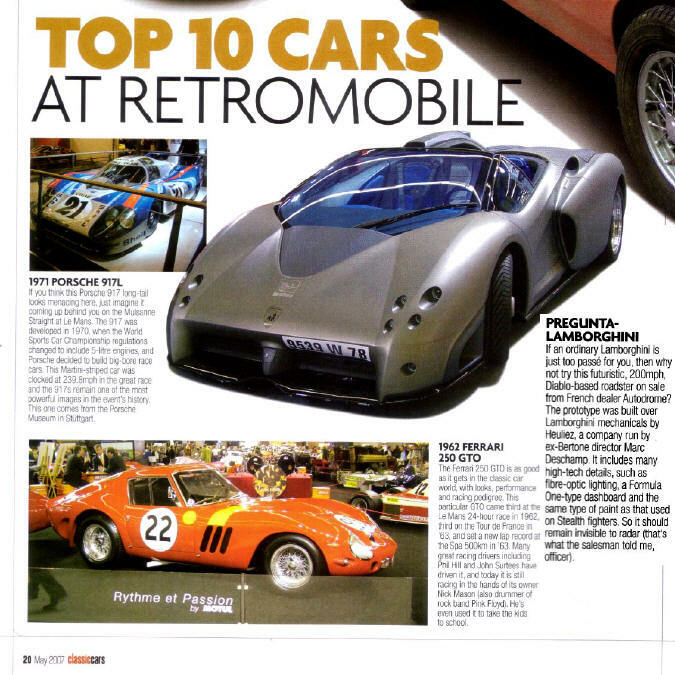 The British magazine Classic Cars highlights the Lamborghini Pregunta as one of the 10 best cars at Retromobile. with the Ferrari 250 GTO (Nick Mason's Collection) and the Martini Racing Porsche 917 (Porsche Museum). RETROVISEUR, one of the most respected classic car magazines, comments on Autodrome Cannes. 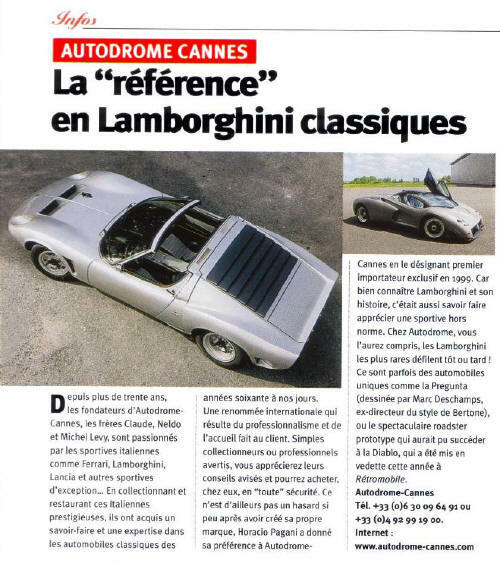 Their conclusion, based on Autodrome's experience and trust relationship with clients: "The best classic Lamborghinis always end at Autodrome-Cannes". "Autodrome Bulletin": Issue ##20 is available. 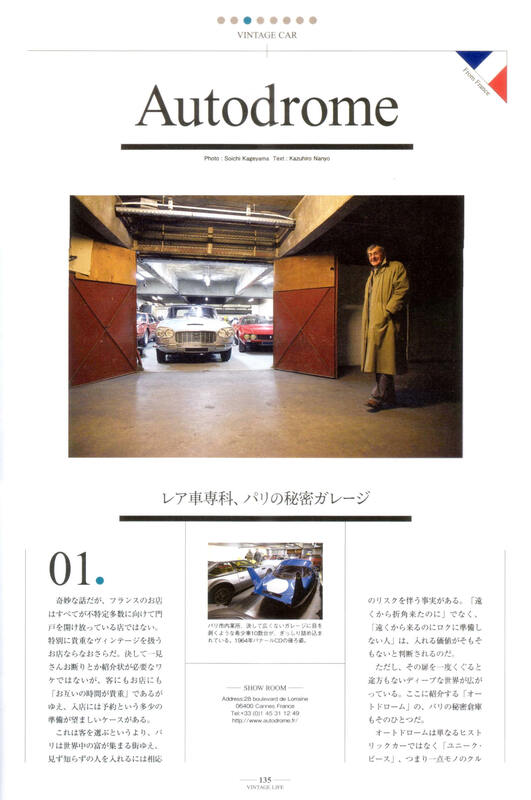 Paolo Stanzani: "How Ferruccio Lamborghini and I launched the Bugatti EB110 project ..."
(Interview by Michel Levy, Autodrome). From Cannes to Prague in a Pagani Zonda S... in one night and under a heavy rain. Preview/For sale: Bugatti Veyron 16.4, Zonda F berlinetta new. The Classic Car Market is safer than Stock exchange...and a source of pleasure ! Presentation of the PAGANI Zonda F at AUTODROME Cannes : a friendly gathering around a glass of Champagne. "Mankind is becoming mono-cultural ; we are getting prepared to mass-produce civilization, like beetroot. The menu will be composed of this single dish". (Claude Lévi-Strauss). 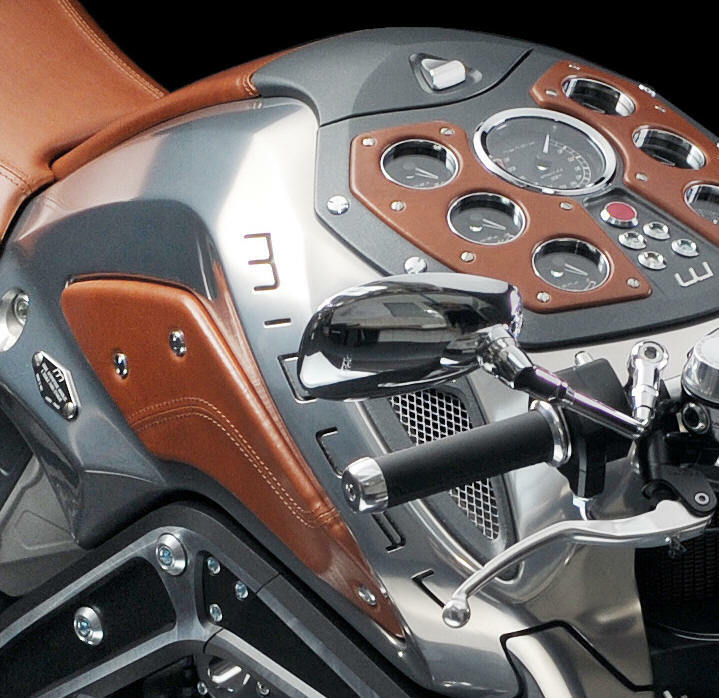 Autodrome clients demand exclusive automobiles, of the highest quality but also unusual ones. No wonder that precious encounters happen then...You only live once. Some individuals (not necessarily the richest ones) cannot stand to be lost in the crowd of banality, it's a matter of character - whether you have one or not. They just want to live up to their true expectations. One very special day, you see a car : it's this one - and no other - you just need it. This tool offers you instant access to key technical specs, historical details, production years and quantities, about 1500 different models, focusing mainly on post-war cars. This new service is not meant to be compared to existing specialised sites, dedicated to one make or even to one model ; instead, this tool is designed to be quick, simple to use, and synthetic. You will get immediate answer to many questions such as : how many Aston-Martin DB5 have been built ? How many versions for the Jensen Interceptor ? Is the Lamborghini Islero more rare than the Miura ? What are the key characteristics of the first Porsche 356 ? We are confident that our competencies and experience are a value to our customers. This database is a work in progress, and will be completed with time. Thank you for your feed-back on any mistake or missing information. To access the Autodrome Database, just click on the AUTODROME checkered flag. Enjoy the visit ! AUTODROME on the Web : a worldwide network, 70 countries, 80.000 hits / month ! Gran Turismo... the truth about hi-performance GTs. Classic Cars as masterworks: are automobiles more than machines ? 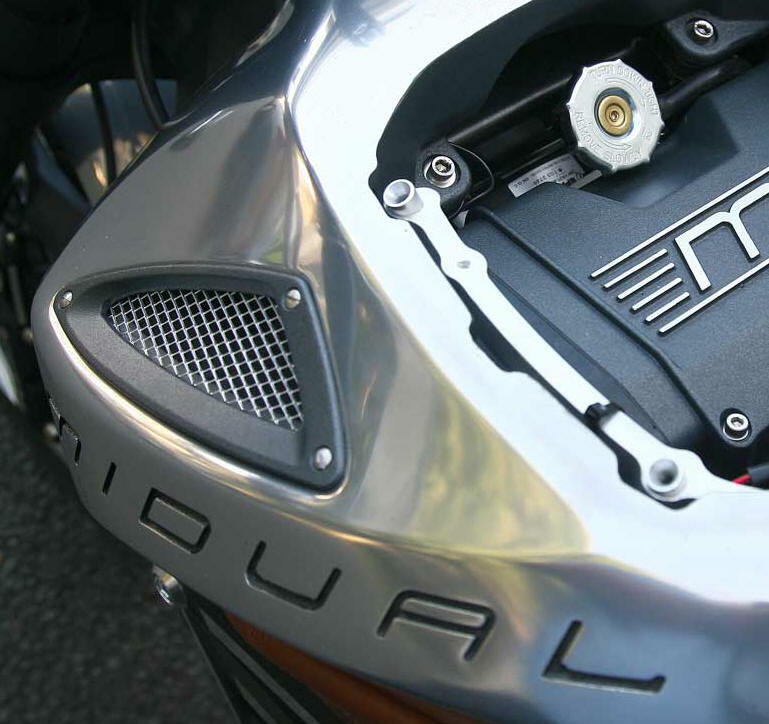 Torque and power : understanding the figures and their meaning (in French). AUTODROME’s reputation, built through four decades, is based on a very unique way of doing business, where mutual trust is a key value. We have established long-term relations with our clients and partners, fostered by a shared enthusiasm for classic and performance cars. As a result, we are proud of providing our clients with the very best examples of prestige and sports cars available on the market. 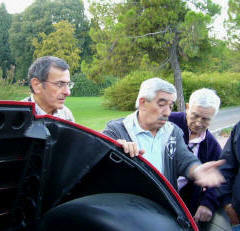 - Autodrome has been exclusive French importer for Pagani Automobili since 1999. - We buy & sell Classic Automobiles, specialising in classic Lamborghini, Ferrari, Maserati, Lancia, Aston-Martin, Bentley, Bugatti, as well as sports and luxury modern cars. 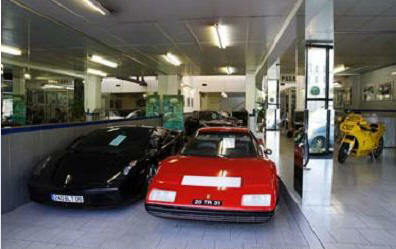 - We sell new cars : Lamborghini, Ferrari, amongst others. With our 35-year experience, we offer the best advice and support for such investments, with excellent payment conditions. 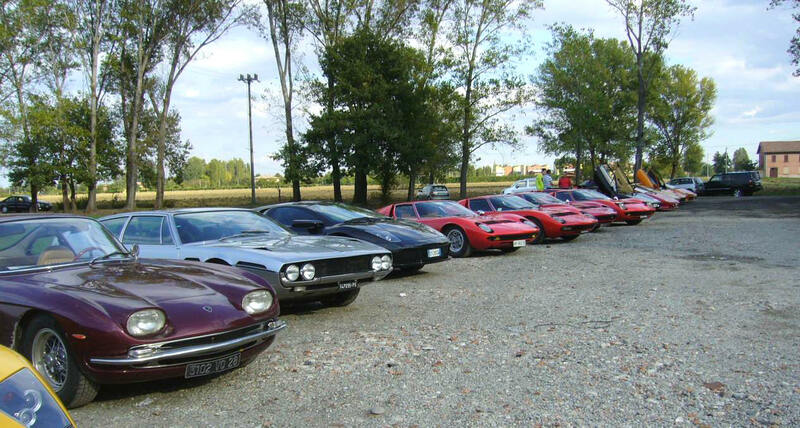 AUTODROME has excellent, long-standing relations with the Sant'Agata plant and takes your order for your new Lamborghini and Ferrari. We select only the best opportunities, based on careful maintenance, history, rarity or price-to-value ratio. Autodrome provides cars in mint condition, or extremely rare, and always with expert advice to optimise your investment. Legends become available at surprisingly realistic prices, making it possible for you to enjoy the best of Classics, technology, luxury and style, whilst wisely investing your money.